The long-term esophageal and respiratory complications of esophageal atresia are inter-related: many of these complications increase the risk of the other complications. Eosinophilic Esophagitis is a disease of the esophagus where there are increased numbers of cells called eosinophils, in the walls of the esophagus. Eosinophils are cells usually associated with allergic conditions, such as asthma (when they’re found in the walls of the airways, instead). Eosinophilic esophagitis can be associated with allergies (including food allergies) and with GERD. The most common symptom is difficulty swallowing, with food getting stuck in the esophagus while swallowing. So, the symptoms are similar to the conditions described above. Recent studies have suggested that about 17% of EA patients may have eosinophilic esophagitis. It’s usually diagnosed by upper endoscopy. Treatments may include corticosteroid slurries, elimination diets, and treatment with medications for GERD. A number of studies have looked at quality of life in children and adults with EA. The studies suggest that while many people with a history of EA cope well with this condition, some people experience reduced quality of life, including social interactions, mental health, and a feeling of well-being. This can be related to esophageal issues including GERD, and unhappiness over their EA surgery scar. People who have more frequent respiratory symptoms, respiratory infections, or hospitalizations for respiratory problems may also experience reductions in their quality of life. Difficulty swallowing, and choking on food, is common in people born with esophageal atresia. Hard and dry foods are often particularly difficult – such as bread and meats such as steak and hot dogs. Food may be retained in the esophagus, then travel back into the mouth, and travel into the airways (known as aspiration). This can cause lung damage or recurrent pneumonias. Difficulty swallowing may also impair growth in children. Sometimes, pieces of food may get stuck, and have to be removed by placing a telescope in the esophagus, which is known as an Upper Endoscopy. Abnormal muscle coordination in the esophagus is usually diagnosed by an Upper GI Series or Barium Swallow, where X-rays are done while the patient swallows some barium. Poor or absent muscle function is called “esophageal dysmotility” or “abnormal esophageal peristalsis.” This can also be diagnosed by esophageal manometry, where a catheter, placed in the esophagus, can measure the pressure generated by contraction of the esophagus’ muscles. Eat a little, then drink some water, then eat a little, then drink some water, and continue this until the meal is done. For many people, this will prevent these problems. Following the EA surgery, the area of the original repair (and TEF) often gets hardened and narrows. This is known as an Esophageal Stricture, and occurs in up to 40% of EA patients. Symptoms of a stricture include difficulty swallowing, vomiting and disinterest in eating in 80% of cases, aspiration and recurrent pneumonia in 12% of cases, and food getting stuck in the esophagus (called an “esophageal foreign body”) in 8% of cases. Esophageal strictures are usually diagnosed by an Upper GI Series (or Barium swallow). Esophageal Strictures are usually treated by Upper Endoscopy, and dilating the esophagus with progressive plastic or metal probes or hydrostatic balloons dilators. Strictures often recur, and it’s not unusual for patients to need multiple treatments for strictures. 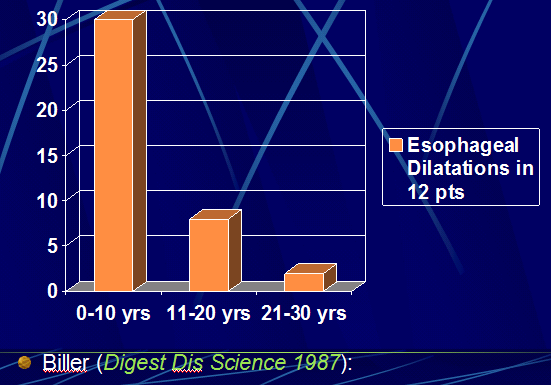 Fortunately, as children mature into adults, their need for esophageal dilatations tends to decrease a lot. Gastroesophageal Reflux increases inflammation in the esophagus (just like a burn to the skin makes the skin hardened), so GERD increases the risk of strictures, and strictures are harder to treat when GERD is present and incompletely treated. Many factors play a role in the high prevalence of GERD in EA, but the lack of appropriate signals from the nerve network in the esophagus, needed to tell the Lower Esophageal Sphincter when to open or close is probably the most important. Between about 25 and 40% of EA patients have GERD (even more when sophisticated testing is used). GERD can cause recurrent vomiting, heartburn, esophageal strictures, impaired growth in children, stopping-breathing or blue spells in babies, lung damage, and recurrent pneumonia. There is evidence that persistent GERD can cause permanent scarring and damage to the esophagus (known as Barrett’s Esophagus), and increase the risk of esophageal cancer in adults with EA, so adults with a history of EA should probably have an upper endoscopy every several years. Upper GI Series (Barium Swallow) Patient drinks barium and X-rays are taken of the esophagus. Not uncomfortable. Also gives a detailed look at esophageal function. Only looks for GERD for a brief period of time. Esophageal Manometry Catheter is placed in the esophagus to measure pressure generated when the esophagus contracts Can assess Lower Esophageal Sphincter function. Uncomfortable. Esophageal pH probe and/or esophageal impedance study A small catheter is placed in the esophagus for 24 hours, to measure acidity caused by reflux of gastric acid, or changes in the electric activity in the esophagus caused by reflux of acid or non-acid gastric fluid into the esophagus (impedance study). Looks for GERD for a full 24 hours. Can correlate GERD with symptoms (cough, heartburn). Accurately assesses frequency of reflux events. Uncomfortable. Upper Endoscopy A telescope is placed in the esophagus to look at it. Samples of the esophagus are taken to look for inflammation (burns of the esophagus) – known as biopsies. Assesses severity of GERD. Can look for esophageal cancer in adults. Uncomfortable. May need a general anesthetic in children. Bronchoscopy A telescope is placed in the airway, and samples of lung fluid taken to look for signs of aspirated food, such as fats from milk or formula May look for direct evidence of aspiration. Uncomfortable. Often requires general anesthetic in children. If the test is positive, doesn’t tell whether aspiration is due to swallowing difficulties or from GERD (or both). Accuracy of this test, as a test for aspiration, is controversial. If there are concerns about GERD, your doctors will decide which tests are appropriate to diagnose GERD in you, or your child. Sometimes, the best test for GERD is trying to treat it with anti-GERD medications; if symptoms resolve, this often can mean that the symptom(s) were due to GERD. GERD can be treated with either medications or surgery. The commonest medications used to treat GERD reduce acid in the stomach, which decreases the harmful effects of acid entering the esophagus. These medications include ranitidine and many “proton pump inhibitors” (which tend to be stronger) such as omeprazole, lansoprazole, and esomeprazole (there are many others – depending on the country). Medications work in about half of EA patients with GERD. The usual surgical treatment for severe GERD that didn’t respond to medications is called a fundoplication. About 15-25% of EA patients need this procedure. In this operation, the top part of the stomach is wrapped around the bottom of the stomach, strengthening the Lower Esophageal Sphincter. After the surgery, people usually can’t vomit, which is uncomfortable if they have gastroenteritis (“the stomach flu”) and they may have problems with retching. Fundoplications are tricky in people with EA. If there is very poor esophageal muscle function and the lower esophageal sphincter is made too tight, the esophagus may not be able to get food into the stomach, and aspiration of contents remaining in the esophagus may actually become worse. Some EA patients may therefore need a “leaky fundoplication,” which only reduces the amount of GERD. Fundoplications tend to loosen over time, and GERD may recur in about a quarter of patients who’ve had a fundoplication. So, if GERD symptoms recur after this operation, the individual should be re-evaluated for GERD. Pediatr Surg Int. 2011 Nov;27(11):1141-9.